This post was originally published on Insane Unity’s devblog, with both english and french versions. There, you’ll find other technical articles about Win That War!, our upcoming RTS game. 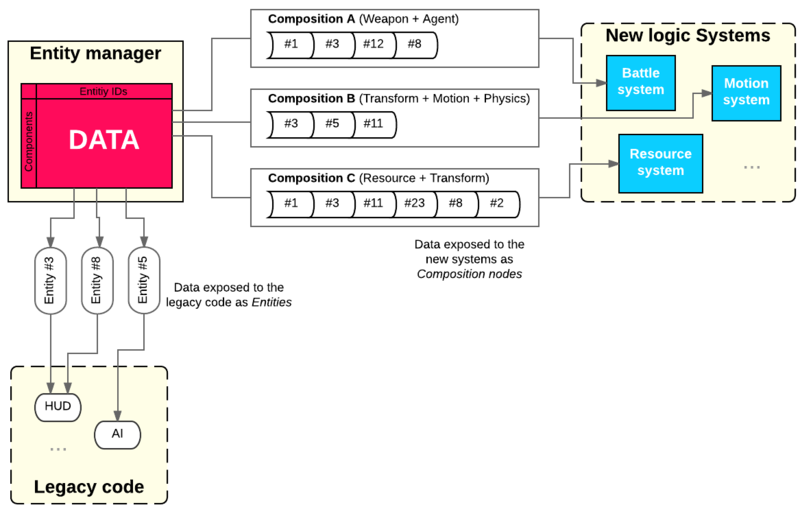 This post describes the switch of our gameplay codebase from a class hierarchy to an architecture based on the Entity-Component-System pattern (ECS). It will first explain why we undertook this refactoring and then present the new ECS framework with which we are currently developing Win That War!. The description is accompanied by some code samples as this post is voluntarily geared towards readers who are curious about the technical details of such an implementation. The Win That War! team is growing and the scope of the game has evolved towards a richer design than originally planned. Concretely, this means that we now need to support new game mechanics as well as new units with some unanticipated characteristics. The command unit is both a building and a unit that materializes the player’s presence on the game map. The player’s buildings can only operate within the range of a Command Unit and its destruction triggers the player’s defeat. In other words, this unit must be able to anchor itself on the ground, like a building, but also to take off in order to establish new bases on any other point of the map. 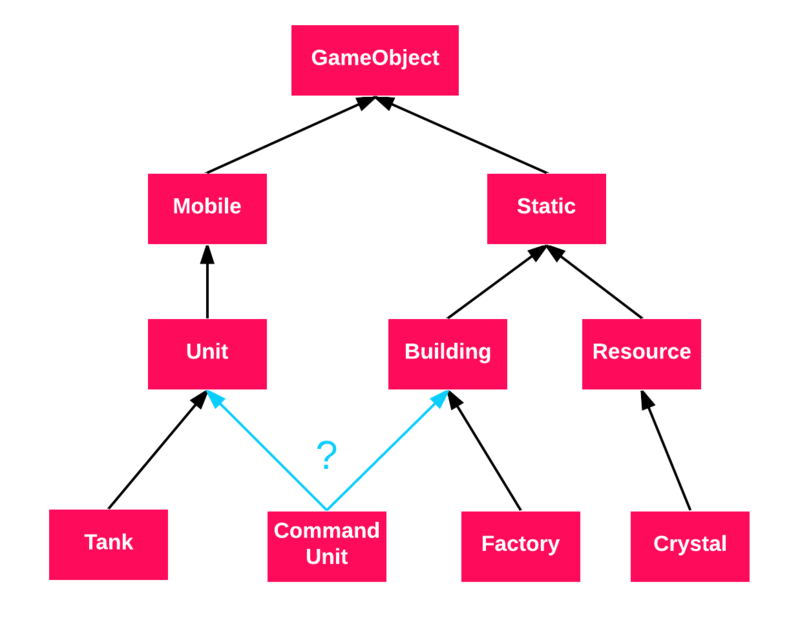 Behold the first flaw of the class tree, the dreaded diamond: due to the tree-like nature of our architecture, we got to a point where it was impossible to share antagonist behaviors such as being both a static building and a mobile unit. Fig. 1 — Simplified representation of the initial architecture. The new Command Unit does not fit in this hierarchy. At this point, we had two options. Option 1 was to go deeper into the rabbit hole and create a new subclass of GameObject (imagine a StaticButSometimesMobile class alongside Mobile and Static). Option 2 was to think ahead and switch to a more flexible architecture. Given the loads of other units and mechanics that are planned, it became obvious that we really needed to look at alternatives. After some consideration, we chose the Entity-Component-System pattern. In the meantime, we settled for a quick hack: two versions of the Command Unit were coded, a mobile one and a static one, and we swapped them when landing/taking off. Let’s just say that we were only moderately satisfied with this approach. Some code had to be duplicated and having this very specific swapping logic for a single type of unit did not sit well with us. Entities: the concrete instances of our game objects. For example, units, buildings, decor elements and cameras can all be entities. Conceptually, an entity can be seen as a bag of components. Components: the pieces of data that represent specific aspects of the entity that they belong to. For example, position, physics parameters, 3D models and health could all be components. It is the aggregation of components that defines the nature of an entity. We call this set of components the entity’s composition. A strong characteristic of the ECS pattern is that components should only contain data and no logic. Systems: the modules that govern the logic of specific parts of the game by manipulating related components (Fig. 2). For example, a Drawing system could examine the Position and Model components of entities in order to render them. A Physics system could examine Velocity components to mutate Position components. Another strong characteristic of the ECS pattern is that all the game logic should reside in systems and that systems are responsible for the interaction between components. Fig. 2 — Entities (Top) can be seen as “bags of components”. Systems (Bottom) update them. There is a clean separation between data and logic. ECS is a component-based pattern with a strict separation of data and logic. The Unity game engine often comes into the discussion when speaking of components. However, the vanilla Unity approach is looser in its definition: a component (MonoBehaviour) contains both the data and the logic. Some libraries do provide an ECS layer for Unity, such as Entitas. Flexibility: it will be trivial to dynamically alter the nature of our entities. Want to temporarily buff a unit? Simply change the data in the appropriate component or swap it with another component altogether. Similarly, systems can be enabled/disabled at runtime, which is extremely useful to un-complexify the game for testing/debugging or to reproduce Minimal Working Examples. Data-driven: because ECS is so strict about the separation of data and logic, we should naturally end up with a more data-oriented application. Hence, it will be more straightforward to deserialize our on-disk game data (authored by the game designer) into game entities. Similarly, it will be easier to sync this data over the network without resorting to an intermediary form. While it was not the reason for this refactoring, ECS is also known to be performance-friendly because the underlying data structures are often layout in a way that corresponds to their processing. That is, same-type components that are processed sequentially by logic systems are contiguous in memory. Thus, the CPU cache is happy. The new architecture had to mesh well with most of the code that was already in place. To this end, we designed the central data store for entities and components (the Entity Manager) to expose them in different forms to the “legacy” code and to the “new” code (which will reside in Systems). The gist of it is that the legacy code uses stand-alone Entities with a similar API as the old stand-alone GameObjects. However, the new ECS systems leverage a more sophisticated approach in which they process views on entities that match certain compositions (each system has it own criteria). Fig. 3 gives an overview of this architecture. Each part will be discussed in the following sections. Fig. 3 — Our ECS architecture. The game data is exposed to the “new” code and to the “legacy” code in different forms. We use an interface to mark a class as being a component. Notice that there is no internal references to the entity that owns the component. This is a voluntary design choice: not exposing the owner forbids indelicate programmers to access unrelated data (eg. myTransform.Owner.AnUnrelatedComponent). Even more importantly, not exposing the owner prevents to add any logic to the components that could mutate them from the inside, since their context of execution (the “neighbor components”) is unknown. The way in which logic systems do access this context in order to make components interact will be discussed in a further section. // Component "matrix", most of the game data is stored here. // The first key is the type of component. // The second key is the entity's ID. Managing the entities lifetime. Users have control over the creation and destruction of entities. On creation, an entity is given a unique ID by the manager. Under the hood, entities are stored in a map in which they are indexed by this ID. 2. Composing entities. Users can create, destroy, and query components. Components are stored in a matrix-like structure where rows correspond to the various types of components, and columns correspond to entities. Querying component X of entity Y is a matter of looking at element (X, Y) in this map. Tab. 1 illustrates the kind of data that can be found inside the matrix if you were to inspect its content (this article provides a nice illustration of this layout). 3. Categorizing entities with respect to their composition. The last job of the manager is to keep track of which entities match a set of user-defined compositions. In this way, logic systems can process only a subset of the existing entities and only consider components that are consistent with their work. This mechanics is detailed in the Logic Systems section. Tab. 1 — The game data is stored in a matrix-like structure that associates component types and entity IDs. Rows correspond to component types. Columns correspond to individual entities. Changing the composition of an entity simply consists in filling its slots with other components. This structure is a good illustration of the flexibility provided by ECS. It really favors experimentation and quick iteration because, once all our components are defined, we can design entities with novel behaviors in a pinch. For instance, it’s trivial to weaponize a factory (give a Weapon component to #4) or to make some decor elements interactive (switch the RigidBody of #2 from static to dynamic) so that players can play with them. An IEntity instance exposes methods for mutating and inspecting a specific game entity. In practice, this interface is mostly used by legacy code that has not been converted to ECS. Because its usage closely resembles that of the previous architecture (a stand-alone GameObject held all the data of a single unit/building/game thingy), we kept a similar API, which significantly reduced the amount of code rewrite. The concrete Entity class that we use acts as a facade for the EntityManager. It also adds a layer of cache in order to reduce queries for the most used components, plus game-related metadata that we had to keep for legacy reasons. We did not want to iterate blindly through all entities (there could be thousands), filtering them away with some predicate, only to process a fraction of them. Instead, we needed a way for each system to express which types of entities it is interested in ahead of time, so that it would only process those. This mechanics is made possible by the formulation of compositions. A composition is a user-defined class with a number of fields of type IComponent, as well as a reference to an entity that possesses said components. A composition instance, or node, can be seen as a view on an entity, exposing only components of interest. Their creation is handled by the entity manager who is already responsible for mutating the entities and thus provides the best place to also inspect them when a change in composition happens. Basically, for each existing composition type TComposition, the manager has an internal collection CompositionNodes<TComposition> containing one node for each entity that matches TComposition (see code sample below). // many of those collections as there are composition types. // All the matching entities are exposed via those "nodes"
// changes in order to check if it matches TComposition. // the entity's components will be created. The logic systems can access those node collections via the EntityManager.GetNodes<TComposition>() method that was seen previously. They can also subscribe to two events: OnNodeCreated(node) and OnNodeDestroyed(node). The collection raises OnNodeCreated when an entity matches the composition and it raises OnNodeRemoved when an entity does not match it anymore. In this way, systems do not need to consider an entity during its whole lifetime, but only when the entity’s composition is relevant to its work. Here is an example of a physics system written with this strategy. In this example, the system reacts to new entities having both a Transform and a RigidBody, and it manipulates nodes exposing only those two components. A benefit of this approach is that a programmer does not need to know the inner workings of our ECS implementation by heart to write new systems. The entity manager does all the bookkeeping by tracking which entities match which compositions, and systems just have to listen to the events that it raises. This notion of expressing subsets of entities to work on can be found in other forms in established ECS libraries. For instance, Artemis-odb lets users formulate aspects and the Ash framework lets users define nodes in a way similar to ours. After spending several months coding gameplay within this new architecture based on ECS, some conclusions can be drawn. Unavoidably, refactoring a sizable codebase such as Win That War!‘s was several week’s work. Switching to this new “philosophy” also required a bit of getting used to from everyone in the team. So, all in all, the move to ECS took a bite in our schedule. However, the promise of ECS is to make up for this lost time with greater speed and flexibility during the rest of the development. It seems that ECS is already paying dividends as we now iterate more quickly on new features. We had to make some compromises during the switch to ECS and chose to convert specific parts of the codebase in priority. Some aspects of the game logic still adhere to the old ways of doing things and will probably not be updated due to lack of time. And this is fine, because these parts interface well with the Entity facade that we described. In any case, the code that has been converted — as well as new code — feels cleaner. It’s just simpler to write clear, explicit code, and a lot of complex use cases just seem to sort themselves out naturally. Finally, the ECS favors isolation, which is precious for testing/debugging purposes. For instance, we obviously don’t want to pull all of the game rules in our unit tests and some game mechanics that would be constraining in this context (eg. the need to be close a relay for a unit to be active) can be trivially disabled by turning off the systems that handle them. Fig. 4 — Some components actually used in Win That War! for different units. To conclude, switching Win That War! to the Entity-Component-System pattern required a significative amount of work but we are already reaping some benefits. The gameplay code is more modular since various aspects of the game are now neatly decoupled from each other. Most importantly the game code feels clearer and gives us a better sense of control. For the curious, Fig. 4 shows a screenshot of Win That War! with some of the components that are actually used under the hood. About this Command Unit trick that we had to resort to (the building version sneakily swapped for the mobile version): now we just give our unit a Building component when it lands. When the unit takes off, we replace the Building with a Motion component and all is well in the ECS world!